Kingdom Hearts: Chain of Memories (キングダム ハーツ チェイン オブ メモリーズ, Kingudamu Hātsu Chein Obu Memorīzu?) is an action role-playing game developed by Square Enix and Japanese studio Jupiter and published by Square Enix in 2004 for the Game Boy Advance. The game serves as an intermediary between the two larger-scale PlayStation 2 games in the Kingdom Hearts series. It was one of the first GBA games to incorporate full motion video (FMV). 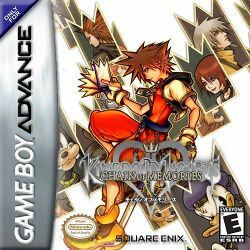 Kingdom Hearts: Chain of Memories is the second game in the Kingdom Hearts series. It is a direct sequel to Kingdom Hearts, and its ending is set about a year before Kingdom Hearts II. 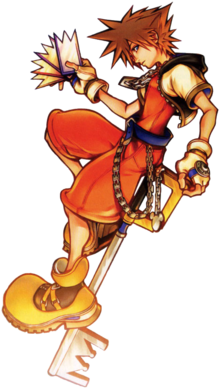 The story centers around the protagonist of the first game, Sora, exploring a mysterious castle in search of his friends. As he ascends the castle, his friend and rival, Riku, explores the basement levels and fights his inner darkness. The game introduces new characters and plotlines that further expand the Kingdom Hearts universe and set up the premise for Kingdom Hearts II. The game takes place in Castle Oblivion, a mysterious castle kept by Marluxia. Sora and his teammates are told that the castle causes visitors to lose their memories upon entering. The lobby and areas between floors are white with flower-themed decorations, but each floor can be transformed into a different world from the first Kingdom Hearts game using "world cards" created from Sora's memories. Like before, many of the worlds are based on Disney films while the rest were created by Square Enix. This page was last edited on 11 June 2011, at 00:55.